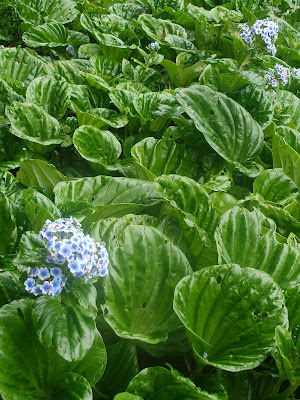 The Chatham Islands forget-me-not Myosotidium hortensia, from here. I haven't been able to prepare a full post lately as we're currently in the field conducting our next survey round for the day job. 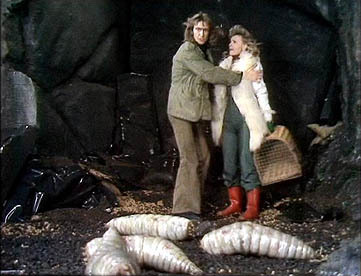 In the meantime, I'll just content myself with a brief introducion to the Cynoglosseae. This is a tribe in the plant family Boraginaceae, redefined by Långström & Chase (2002) on the basis of molecular phylogeny to effectively correspond to the clade of Boraginaceae with heterocolpate pollen, as well as an undivided style with a single stigma (another tribe of Boraginaceae, the Boragineae, was covered in an earlier post). In the heterocolpate pollen of Cynoglosseae, the three apertures found in the pollen of other Boraginaceae alternate with an equal number of 'pseudoapertures'. The pseudoapertures represent gaps in the outer exine coat of the pollen grain like the apertures, but lack certain other features of the latter such as a concentration of cytoplasmic vesicles, as well as being longer and narrower (Hargrove & Simpson 2003). 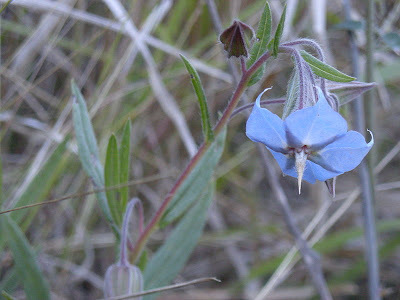 Flower of camelbush Trichodesma zeyanicum, photographed by Ethel Aardvark. Perhaps the most familiar members of this usage of Cynoglosseae are the forget-me-nots of the genus Myosotis, with other members including the hound's-tongue Cynoglossum officinale and, here in Australia, the camelbush Trichodesma zeylanicum. Offhand, camelbushes are generally one of the more prominent flowering plants here on Barrow Island, my current location, though they're one a bit of a low right now. There has been a bit of rain, and camelbush doesn't like to get its feet wet. The traditional associations of forget-me-nots, of course, are right there in their name. There are a number of stories supposedly explaining how these flowers came to be associated with the memory of loved ones (surely the most ridiculous being the one that apparently has a knight drowning under the weight of a bouquet of the things) but the true reasons are probably lost to history. My own suspicion is that it is perhaps ultimately because forget-me-nots are relatively unassuming as flowers go, making them an ideal symbol of beauty that should not be overlooked for the sake of more flashy but perhaps less reliable competitors. 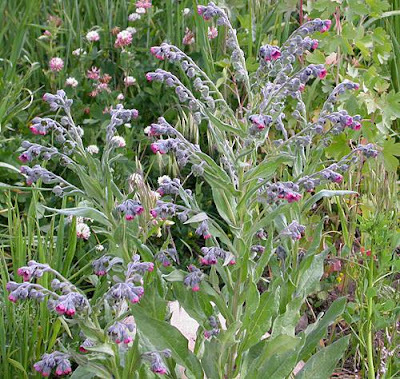 Hound's-tongue Cynoglossum officinale, from here. Native to Europe, this plant has become established in many parts of North America. Hound's-tongue, on the other hand, seems to get its name from the resemblance of its leaves to its namesake. This plant doesn't seem to have quite the same hold on human affection as the forget-me-not, and the reason for this may be indicated by some of its other vernacular names: 'monk's nit' or 'beggar's lice', in reference to its sticky seeds that adhere to clothing (perhaps 'gypsy flower' derives from the same source?) and, even more damning, 'rats and mice', referring to its unmistakeable smell. Hargrove, L., & M. G. Simpson. 2003. Ultrastructure of heterocolpate pollen in Cryptantha (Boraginaceae). International Journal of Plant Sciences 164 (1): 137-151. Långström, E., & M. W. Chase. 2002. Tribes of Boraginoideae (Boraginaceae) and placement of Antiphytum, Echiochilon, Ogastemma and Sericostoma: a phylogenetic analysis based on atpB plastid DNA sequence data. 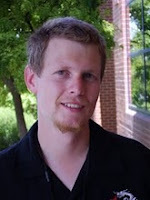 Plant Systematics and Evolution 234: 137-153. Supposedly (wikipedia) Houndstongue's name comes from its protection against dog attacks. A leaf in your shoe is supposed to keep them away. As it happens I know where a stand is not far from me, and coincidentally there's a weimeraner not far from there that bit me a few years back. So I'm well-positioned to verify the plant's powers experimentally, but have so far been too chicken. I saw that comment in Wikipedia as well, but it's not referenced and I wasn't able to find corroboration anywhere else, so I don't know whether to credit it. Mind you, it does sound like exactly the sort of twaddle that Doctrine of Signatures would come up with. Good to see that you're still around, by the way. Hope the last year's been fun for you. I always thought it was because the seeds are rough like a hounds tongue, but come to think of it, more like a cats! Not a beloved plant here, for sure. Thanks for an informative post, Chris!